Spanish Mackerel or Scomboromorus Commerson is a highly targeted blue water species. They get big, they run hard and they taste good. What more could a spear fisherman ask for? 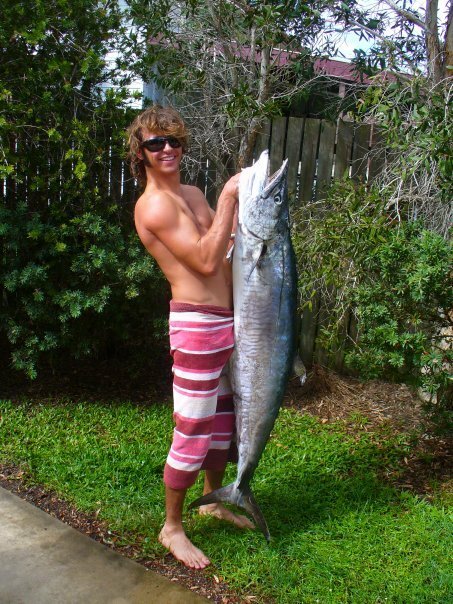 Add to this Spanish Mackerel can be accessed from the shore and nothing feels better than emerging from the ocean with a large pelagic fish draped over your shoulder as you make your way back to your car in front of stunned onlookers who will never judge your choice of camouflaged wetsuit again. But the best thing for the novice is Spanish Mackerel are not that difficult to shoot once you get a few basics under control and you don’t need a thousand dollar blue water cannon either. So as part of our month of Mackerel I will explain my must do’s for finding and hunting Spanish Mackerel. I’m sure there are a bunch more tactics and advice out there but these are the things I’ve picked up along the way, but as always please add your comments below. Andrew Paige with a 36kg spaniard taken from the spot mentioned below with a 1.2m gun. Spanish Mackerel are apex predators and love a bit of current or disturbance where they can find schools of baitfish to prey upon. This might be in the form of a bommie, a reef edge, sand channel or the point of a headland where the current is running. Let me explain how I came to realise this as a novice. A few years ago as a noob I stumbled across a secret little spot not more than 60m off the shore five minutes down the road from where I lived. This inconspicuous part of the coast unbeknownst to me had everything going for it to hold bulk Mackerel. It was a little rubbly rocky point that dropped into eight metres of water sharply with two small bays either side that held coral and schools of yellow tail pike. To the front of the point was sand for about 50m with a bommie that protruded out of the sand sharply. At any time of the day an unremarkable piece of reef. However this place really turned it on when the tide turned. When the tide turned and started to run out there was a current that would sweep Northward along the coastline. The tide would channel in between the point and the Bommie causing the bait to get tired and move from the bays to the pressure wave of the bommie where the Mackerel would show up on masse and on some days que up behind the bommie picking off the bait fish. Over time it became all too predictable for my mate Paigey and I to determine when and where we could get a spaniard but as the simple individual it took me a while to realise what was making this spot work. 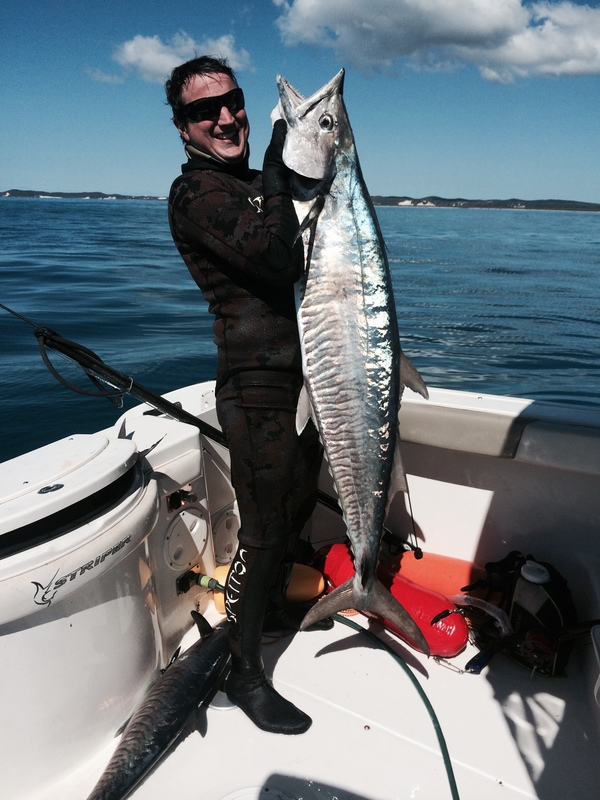 A 22kg fish taken from the same spot as Andrew’s 36kg monster two months later with a 1.2m rail gun. This brings me to the tide and time. In my experience from shore diving for these fish it’s a case of the early bird gets the worm. I have had much more luck in the early hours of the morning or late afternoon however they can and will show up at any time. As mentioned earlier I have also found that on shallow inshore reefs that the very top of the run out tide produced more fish for me. I will generally get in the water two hours before high tide and if the high tide falls around sun up you are in with a good chance of seeing Mackerel. These days we do a lot more boat diving and have found flashers and burley to be potent. Flashers worked midwater between a couple of divers works great and according to Rob Allen, flashers with small reflectors work better. In fact Rob says that during tests with large flashers they have noticed mackerel turning away early. Drifting with a flasher with a one up, one down method works great and you’ve got your buddy there for the second shot if needs be. Don’t dive right on the flasher but give the fish some room. Some divers say if the fish is cagey swim at the flasher he might just want to compete for it with you bringing him in range. Feigning a disinterest in fish can also spark their inquisitive nature and turning away from them might just be what the fish needs to come closer. Richard Pillans A.K.A the mackerel whisperer recommends limiting the number of divers around the flasher as it can cause fish to spook. We have noticed that burley from an oily fish works great at attracting mackerel to the scene and we often work it in with our flashers. An oily fish like mackerel itself can be cubed up with your dive knife and allowed to drift through the water column but be warned it can also attract sharks to the area. When diving keep it smooth, steady and controlled. That means everything from finning to tracking the gun. Fast jerking movements tend to spook fish and also burns oxygen limiting dive time. Andrew Paige pictured above is a shore diving Mackerel specialist and is one of the slowest divers I have seen. He rarely uses flashers and burley but holds very still bottom time around bommies and areas where he suspects are attractive to Mackerel allowing the fish to swim right up on him and the results speak for themselves. Staring these fish down will make them nervous. How nervous? Well in the words of Australian Rugby player Nick Cummins “As nervous as a gypsy with a mortgage” That’s as bad as it gets and as they can move at close to the speed of light it’s best to keep them calm so you can get a decent shot off. Mackerel will also circle you so if you can’t get a shot away stay calm he might just come around again. Try keeping your head down and looking up through your mask to conceal your eyes. Predicting the path of the fish and extending the gun to where you think the fish will be is another tactic to reduce spooking the fish. One of the hardest things you can do when you see your first big Spaniard is to stay calm and wait for the fish to come into range so you can get a good holding shot on the fish. But it’s important for a couple of reasons. Obviously if the fish is shot poorly it can tear off and will die. Secondly a total miss will spook the fish. If the fish is out of range it’s best not to take a long shot as there is a good chance the fish will return if it isn’t spooked. Portions of Spanish Mackerel populations take lengthy migrations along the coastline while others are part of resident populations. For example the Spanish Mackerel found in South East Qld are believed to be migrating fish from populations further North so they can be seasonal. So it’s important to learn their migration habits, preferred sea temps so you know when to expect them. There is heaps of information out there on these fish from government bodies, fishing forums and of course spearfishing pages. I’m not going to spend a lot of time on this but I will say that you don’t need to spend a million dollars on gear to hunt mackerel. In fact if you look at the past five world records most were shot with simple 1.2m rail guns, another reason why this fish is a great first step into the world of pelagics for the novice. The common set up that most people start with is a 1.2m rail gun, 20m float line and an 11L float and it will do the job just fine. If trailing a Mackerel there is a common Jedi mind trick that can be played on mackerel provided the force is strong in you. If you angle across the fish directly behind it into its blind spot the fish will change course slightly to the other way to get a good view of you. Do it again and the fish should turn harder presenting a broadside shot. Easy as that. To be honest I’ve never done it but I’ve heard everyone talk it up so I threw it in the mix. All too often Spaniards are attracted to the sound of a gun being fired. Even if a fish hasn’t been shot Mackerel seem to show up. On more than one occasion I have capitalised on one of Shrek’s off shots and nailed a curious Mackerel. Also if Mackerel are in a school and one has been shot this can fire up the rest of the school and it may be possible for another diver to capitalise. Don’t believe me listen to our Rob Allen interview where he talks about a 70kg fish that gets away. Line fisherman particularly those that use surface poppers often target these fish by sight. A dead giveaway to potential mackerel are flocks of birds hovering and dive-bombing the surface of the water. Beneath the surface could be any number of pelagic species balling up schools of bait where they will attack the school on or near the surface. A giveaway that the school is Mackerel is a long slicing splash arc. Tuna and other species seem to have a shorter splash. Either way there are fish about. It is better to drift into range of the fish rather than steam into the school. The fastest Man in the water Jamie Lough with a nice SE Queensland Spaniard. Note the 1.2m rail gun, float and line. I read in an article about trolling for Spanish Mackerel a few years ago that the boat itself is a fish attracting device or FAD. This is why a set of trolled lures has the “short corner and transom position”. That is the lure trolled in close to the boat, in or near the wash of the prop. What does this mean for spearing Mackerel. Well sometimes, first in best dressed. On many occasions our mate Jaime Lough who can get in the water quicker than anyone I know gets the fish straight up in a minute or so. This doesn’t happen all the time but it does happen on occasion and has led the crew to sabotaging his equipment. Wow I could just keep going but blogging doesn’t pay so I’m going to bed, How to fight and land a spanish Mackerel is coming up next. For some more advice and stories about taking down Spanish Mackerel, have a listen to Rob Allen’s ‘Veterans Vault’ section in our interview with him. We talk tactics, flasher magic and the one that got away.